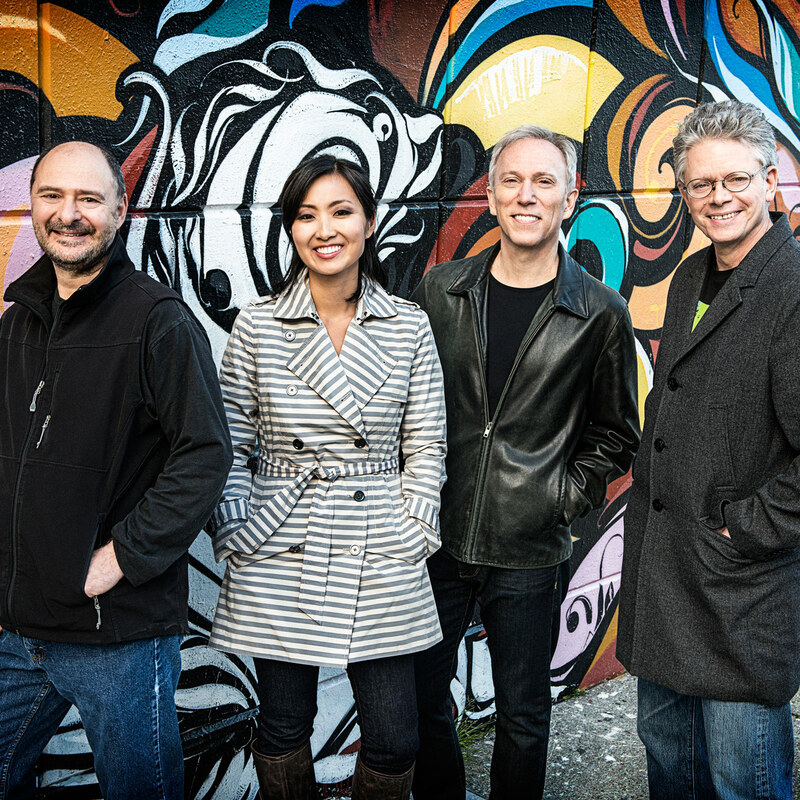 For more than 40 years, the Kronos Quartet—David Harrington (violin), John Sherba (violin), Hank Dutt (viola), and Sunny Yang (cello)—has pursued a singular artistic vision, combining a spirit of fearless exploration with a commitment to continually re-imagining the string quartet experience. In the process, Kronos has become one of the most celebrated and influential groups of our time, performing thousands of concerts worldwide, releasing more than 50 recordings of extraordinary breadth and creativity, collaborating with many of the world’s most intriguing and accomplished composers and performers, and commissioning more than 850 works and arrangements for string quartet. In 2011, Kronos became the only recipients of both the Polar Music Prize and the Avery Fisher Prize, two of the most prestigious awards given to musicians. The group’s numerous awards also include a Grammy for Best Chamber Music Performance (2004) and “Musicians of the Year” (2003) from Musical America. Integral to Kronos’ work is a series of long-running, in-depth collaborations with many of the world’s foremost composers. One of the quartet’s most frequent composer-collaborators is “Father of Minimalism” Terry Riley, whose work with Kronos includes Salome Dances for Peace (1985–86); Sun Rings (2002), a multimedia, NASA-commissioned ode to the earth and its people, featuring celestial sounds and images from space; and The Serquent Risadome, premiered during Kronos’ 40th Anniversary Celebration at Carnegie Hall in 2014. Kronos commissioned and recorded the three string quartets of Polish composer Henryk Górecki, with whom the group worked for more than 25 years. The quartet has also collaborated extensively with composers such as Philip Glass, recording a CD of his string quartets in 1995 and premiering String Quartet No. 6 in 2013, among other projects; Azerbaijan’s Franghiz Ali-Zadeh, whose works are featured on the full-length 2005 release Mugam Sayagi; Steve Reich, from Kronos’ performance of the Grammy-winning composition Different Trains (1989) to the September 11–themed WTC 9⁄11 (2011); and many more. The quartet spends five months of each year on tour, appearing in concert halls, clubs, and festivals around the world including Carnegie Hall, Lincoln Center Out of Doors, Big Ears, BAM Next Wave Festival, Chicago’s Harris Theater, Disney Hall, Palacio de Bellas Artes in Mexico City, Barbican in London, WOMAD, Amsterdam’s Concertgebouw, Shanghai Concert Hall, and Sydney Opera House. Kronos is equally prolific and wide-ranging on recordings. The ensemble’s expansive discography on Nonesuch Records includes collections like Pieces of Africa (1992), a showcase of African-born composers, which simultaneously topped Billboard’s Classical and World Music lists; 1998’s ten-disc anthology,* Kronos Quartet: 25 Years*; Nuevo (2002), a Grammy- and Latin Grammy–nominated celebration of Mexican culture; and the 2004 Grammy-winner, Alban Berg’s Lyric Suite, featuring renowned soprano Dawn Upshaw. Other more recent releases include Rainbow (Smithsonian Folkways, 2010), in collaboration with musicians from Afghanistan and Azerbaijan; and Aheym: Kronos Quartet Plays Music by Bryce Dessner (Anti-, 2013). In celebration of the quartet’s 40th anniversary season in 2014, Nonesuch released both Kronos Explorer Series, a five-CD retrospective boxed set, and the single-disc A Thousand Thoughts, featuring mostly unreleased recordings from throughout Kronos’ career. 2015 brought the release of Tundra Songs by Derek Charke as well as a boxed set of Terry Riley’s music written for and performed by Kronos in celebration of the composer’s 80th birthday. Music publishers Boosey & Hawkes and Kronos have released two editions of Kronos Collection sheet music: Volume 1 (2006), featuring three Kronos-commissioned works; and Volume 2 (2014), featuring six Kronos-commissioned arrangements by composer Osvaldo Golijov. In 2015 KPAA launched a new commissioning and education initiative – Fifty for the Future: The Kronos Learning Repertoire. With Carnegie Hall as a lead partner, KPAA is commissioning 50 new works – 10 per year for five years – devoted to contemporary approaches to the quartet and designed expressly for the training of students and emerging professionals. The works will be created by an eclectic group of composers – 25 women and 25 men. The quartet will premiere each piece and create companion materials, including scores and parts, recordings, videos, performance notes, and composer interviews, that will be distributed online for free. Kronos’ Fifty for the Future will present quartet music as a living art form, and provide young musicians with both an indispensable library of learning and a blueprint for their own future collaborations with composers. Kronos, Carnegie Hall, and an adventurous list of project partners that includes presenters, academic institutions, foundations and individuals, have joined forces to support this exciting new commissioning, performance, education, and legacy project of unprecedented scope and potential impact.